"A solid deep sea thriller"
After the mistake that was the teen-romance How I Live Now, director Kevin Macdonald moves back to safe territory with the maritime thriller Black Sea, working with Utopia writer Dennis Kelly to make a fast pace thriller. 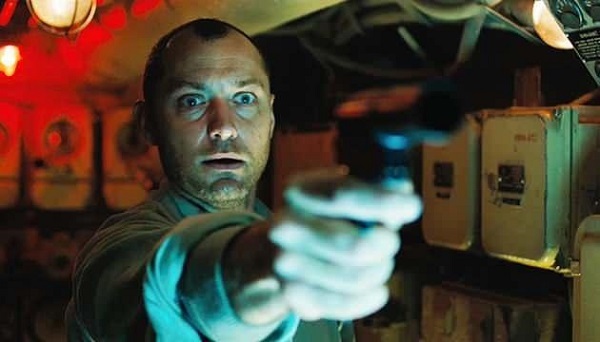 Robinson (Jude Law) is a submarine captain who loses his job at a private marine salvage company. Bitter with his former employers, Robinson finds out about a U-Boat that sank in Black Sea with $40 million worth of gold in 1941. He forms a crew of British and Russian sailors to find the U-Boat in the disputed waters with the promise of an equal share. During the mission, the crew members start to distrust each other, dividing among themselves on nationality, while Robinson's own judgement becomes blinded by the gold. Macdonald employs a gritty, realistic style for Black Sea; it was grim and dirty. When Robinson loses his job, Black Sea starts like a social drama in the sink kitchen realism mold, being set in declining industrial areas, run down pubs, greasy spoon cafes, tower blocks and council estates; focusing on issues like unemployment and industrial decline. Kelly is upfront with his screenplay, using it as his voice to decry the economic state in Britain, the divide between rich and poor, Scoot McNairy's character disparagingly being referenced to as 'The Banker'. Underemployment of skilled people and the treatment of military personnel after their time of service are other threads worked into the film. The realistic style and the themes about urban poverty and wealth division make it similar to certain elements of the Jason Statham 2013 thriller Redemption (Hummingbird in the UK).sta Macdonald uses a hand-held style, which is fitting considering his background in documentary filmmaking. The early parts of the movie look and feel very much like a low budget drama that is popular with British filmmakers. When we get to the submarine we can feel the tight, claustrophobic environment with men who have strong personalities. The sub was hot and dirty, filled with oil and diesel and it was a sweaty environment. It was hard, perilous work. 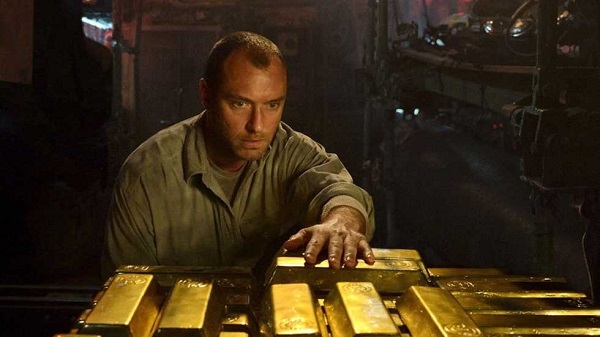 Black Sea is blessed with a strong cast of British and Russian actors and an Australian, led by Jude Law. Law give a strong performance as the Scottish captain who has to lead the mission and keep order between the differing factions. He gets close to a young sailor, descending into irrationality with the promised riches. Though Law was good, his English accent did slip through occasionally. The support cast includes the likes of Ben Mendelsohn (Starred Up), Scoot McNairy, Grigoriy Dobrygin (A Most Wanted Man) and Michael Smiley (A Field in England). It is a highly talented cast where they do get to show their range, even if Mendelsohn is slightly playing to type. They play their roles well and all are well written. Early on in the movie, the submarine crew has to go to Sevastopol to start their mission. The superimposed text said 'Sevastopol, Crimea' and it was hard not to think of real life events overtaking the movie. Black Sea is a well made maritime thriller. The story is standard fare and will not beat the likes of The Last King of Scotland or Touching the Void as Macdonald's best movie, yet it is a satisfying thriller filled with atmosphere and character.